Siemens will not only be expanding its meter data management partnership with Entergy, but the company also revealed it played a role in Consolidated Edison’s new smart meter operation in New York. 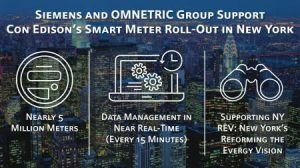 The OMNETRIC Group — a Siemens and Accenture technology services company — assisted the utility in launching a smart meter operation in the Empire State this past summer. Con Edison Company of New York and Orange andRockland Utilities — regulated operating companies of Consolidated Edison — have begun the implementation of Siemens EnergyIP meter data management software, as well. Con Edison aims to use the power consumption information garnered from the software to “improve grid reliability and reduce outages, empower customer engagement and facilitate the integration of renewable energy resources onto the grid,” according to the press release. The EnergyIP data hub has been in use since early June. Before the hub’s implementation, utility employees had to read the data directly on the meters. Now, with the EnergyIP solution, they can automatically query the new smart meters every 15 minutes for this same data. 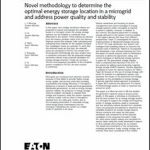 The smart grid project is also in line with New York’s “Reforming the Energy Vision” (REV), which aims to reorient the city’s power supply industry to increase efficiency, improve the state’s carbon dioxide footprint and make the grid more resilient. In further news from Siemens, Entergy plans to build on Siemens’ EnergyIP platform — designed to improve management and analytics capability for meter data — by deploying the company’s analytics foundation and unaccounted for energy applications. This is an extension of a partnership established in September of 2016. 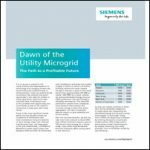 Ultimately, the data and analytics garnered from the EnergyIP Platform and Siemens analytics foundation is expected to cut down on power outages and improve power quality for Entergy’s customer base. “Deployed together, unaccounted for energy applications and analytics foundation offer significant opportunities to transform business process and boost profitability,” said Mike Carlson, president of Siemens Digital Grid, North America. Analytics foundation includes a group of software tools and technologies that works to enable professionals ranging from citizen data scientists to advanced application developers to derive insights from the metering data. The companies contend expanding access to this information may lead to improvements in processes including load research, distribution planning and customer service. Siemen’s unaccounted for energy applications builds upon the analytics foundation and works to improve detection efforts for electricity and gas theft.